A little cake place recently opened near my place. It looks really pretty on the outside, and I have a weakness for chocolate pastries, so it’s only inevitable that I succumb to its allure. So, tonight was the night. Meet Ciel Patisserie, located under a HDB block, in the Hougang area, nestled in Lorong Ah Soo. The pastries range from $2.00 for a bag of madeleines, to $5.80 for an opera cake for individual portions. They also do full-sized tarts and cakes that range from $22 to $47. 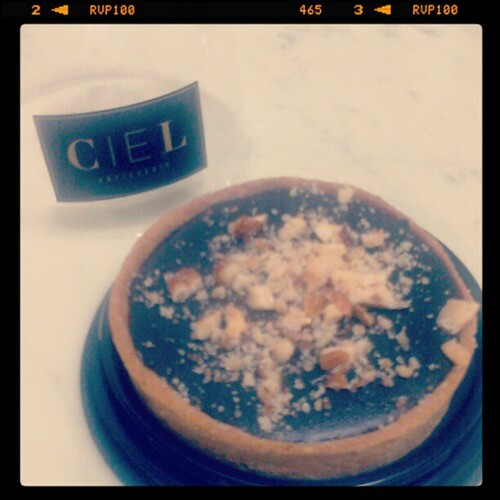 Well, I wasn’t that crazy greedy, and just took away a chocolate hazelnut tart ($4.20). The chocolate was amazing. It doesn’t have that cheap sugar taste, and the chocolate has a rich taste, and very smooth texture. I highly recommend it. I have not tried their espresso drinks, but I suspect a latte ($3.90) would go very well with these sweets. They are pretty small, and probably could seat about 10 people (inside and outside). They also offer various deals on weekdays, particularly at tea time. Do check out their website and Facebook Page for more details.